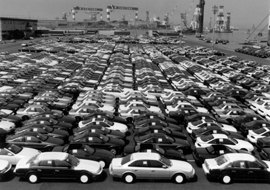 Rows of automobiles stretch across a wharf ready for export. Photo from 1992. After 1955 Japanese auto corporations began to produce more cars then before. At the same time, the government restricted car imports in order to promote the Japanese auto industry. Other countries seldom criticized Japan's protectionism in those days since the car market in Japan was very small. Later, under the guidance of the Ministry of International Trade and Industry, the Japanese auto industry began to weed out small companies through mergers and eventually reached its current state. Japan's annual car production gradually increased. It was less than 10,000 vehicles in 1953, but exceeded 20,000 in 1955. In the late 1960s Japan's car production became similar to Western European countries. Japan started to export cars in the late 1950s, but only a few hundred each year. In 1961 annual exports exceeded 10,000 for the first time. In the early 1970s Japan exported more than one million cars to other countries, primarily to the United States. When car exports began, the reputation of Japanese cars was poor. But their low price based on the low value of the Japanese yen against the US dollar increased the number of Japanese car buyers in the US. Subsequently, the 1973 oil shock increased the popularity of Japanese cars because of their good fuel economy.